​Thank you for that very gracious introduction. It is an honour to be invited back to speak at this great University. Mr Chairman, Prof. Bernard Odoh, it is a pleasure to see you again, and I thank you for the honour of chairing this lecture. I salute the Chief Host, Vice-Chancellor Professor Joe Ahaneku for the kind invitation, for his proactive leadership of UNIZIK and for his friendship. I wish to convey my warmest felicitations to our Special Guest of Honour H.E. Governor Willie Obiano and our Special Guest, H.E. Dr. Nkem Okeke. ​I thank my friends in the Department of Economics and appreciate especially, our Host, Dr. Uju Ezenekwe, the HOD, Dr. Eze A. Eze, Chairman of the Organizing Committee of this lecture series, and Sub-Dean Prof. Uche Nwogugu and the discussant Dr. Uche M. Ozughalu. I will be entirely remiss, if I do not publicly acknowledge the Co-Host, and Dean of the Faculty of Art and Sciences, Prof. Stella Chinyere Okunna, a very dear friend, colleague and interlocutor in many past, present and future endeavours. ​I salute the academic, non-academic staff and students of this University. 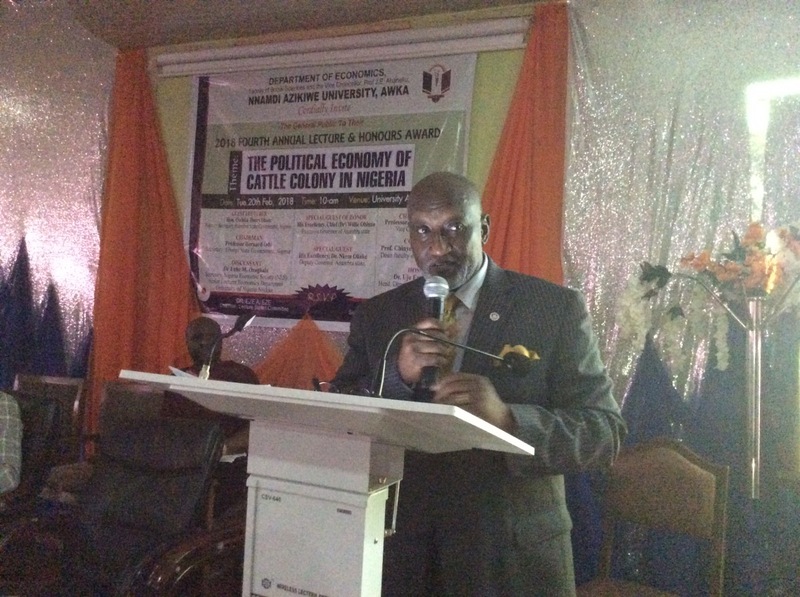 With tertiary institutions like UNIZIK, the role and place of the academia in the discourse, conceptualization and implementation of public policies geared at nation building is assured. Since this is my first public speaking engagement since the 2017 Anambra State Governorship election, I thank those who sent their words of support and prayers, notwithstanding the electoral outcome. I have since ‘dusted my sandals’ and moved on. ​I don’t know what informed the choice of my being selected to deliver this lecture. First, I am not an economist; and secondly, I am not quite certain that those in leadership positions in our country still place any real value on policy debates and wise counsel. So, I am slightly dubious on the impact of lectures such as this in shaping public policies. Be that as it may, I will speak from the neutral position of being a member of the attentive public, a public policy expert and most importantly, as a concerned Nigerian and a friend of this institution of learning. ​Nigeria is a nation of many possibilities; a nation where politics trumps everything. Indeed, it is often said that in Nigeria, anything can happen; and because anything can happen in Nigeria, we now even try to reinvent the wheel. There is an Igbo adage which says “otego a fubalu huwasa na uta” meaning, “we are accustomed to the Hausa brandishing bows and arrows”. Yet all that has changed. As I speak, Nigeria’s geopolitical space stands altered. With Boko Haram raining bombs; and pastoral Fulani herdsmen brandishing AK-47s at will, we have weaponized cattle rearing industry. Disconcertingly, we are witnesses to the incremental weaponizing and militarization of Nigeria’s domestic and geopolitical space. Regrettably, the Federal and State governments have failed woefully in addressing the proliferation of dangerous automatic assault weapons within the ranks of pastoral herdsmen. This is a national disaster in the making and as I have said in my just published book, Prime Witness, “these clashes mimic the unheeded rise of Boko Haram.” Nonetheless, I believe that solving the herdsmen-farmers conflict, require Nigerians rising above the battle space and seeking solutions that serve common cause. 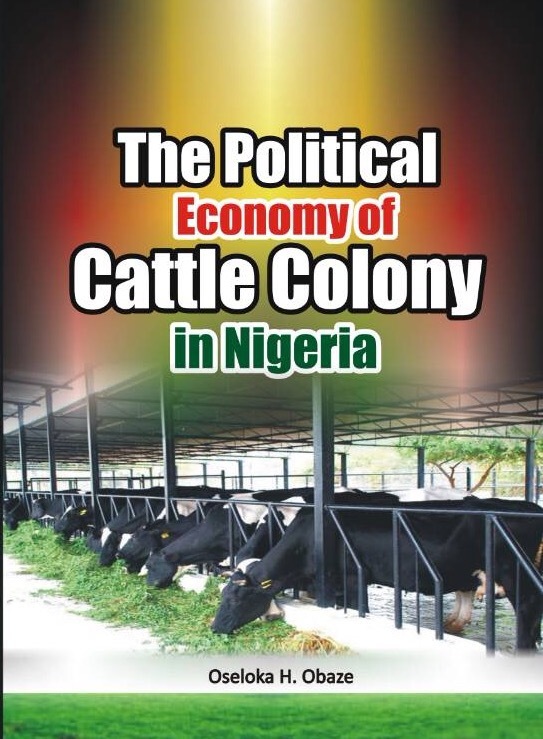 ​The focus of this paper is the political economy of cattle colony in Nigeria. This is a very touchy and polarizing policy issue. And it is understandable that the proposal to establish cattle colonies in Nigeria has evoked the specter of colonialism. According to Wikipedia, “In politics and history, a colony is a territory under the immediate political control of a state, distinct from the home territory of the sovereign.” Naturally, the thought of colonialism alone should not elicit the concerted pushback we have witnessed against this public policy. It is perhaps, the knowledge and awareness of the wanton violence and killings associated recently with the cattle herdsmen that have triggered the prevailing fears. One may add to such concerns, the seeming inability of the federal government of Nigeria to live up to its statutory responsibility to protect Nigerian citizens in their homesteads. ​Unfortunately, in the hue and cry of the visceral violence and loss of lives and properties resulting from herdsmen-farmers clashes, we have as a nation allowed emotions and fear to drown out proper debate, assessments and evaluation of the cattle economy – a critical component of our national economy, wealth, income generation and employment. It is worth stressing, therefore, that as a nation we need to revisit urgently or at least, discuss this public policy issue dispassionately, thus making it a win-win situation for all concerned. ​If the cattle colony policy has created national dissonance, the sources of such dissonance should be obvious. First, cattle rearing are predominantly private businesses and those engaged in it are no different from Nigerians who engage in yam cultivation or motor spare parts trade. But the problem is perhaps one arising from the choice of words used to define the policy rather than the policy itself. As Obi Nwakanma observed, “The word ‘colony’ has a very fraught implication for Africans who were ‘colonized’ by European powers in 1895. The use of the term “cattle colonies” is doubly contentious, and at the heart of the current, fierce resistance …the wrong choice of words could lead to consequences as devastating as wars…it is the federal government through a generally incompetent policy or mechanism that has created this problem of the Fulani herdsmen. There is the question of distrust.” Nonetheless, our concern here, drawing on the Karachi model, is the utility, viability, efficacy and indeed the value, if any, of the political economy of cattle colonies in Nigeria. We must also pause to ask if in the frenzy of rising violence and killings, we have entirely overlooked the added value cattle colonies might bring to our economy, and any contributions it might make to wealth creation and tackling our burgeoning youth unemployment. Without question, the cattle economy is huge both globally and in Nigeria, with very diverse and rich value chains. But before delving into that, let me explore briefly, how we arrived at the policy choice of cattle colonies. ​It is worth recalling that between 2015 and 2017, the National Grazing Reserve Bill sponsored by Senator Rabui Kwankwaso (APC Kano Central), was tabled before the National Assembly for approval. Had the Bill been enacted, it would have empowered the Federal Government “to amass lands in the 36 States of the Federation including Abuja for the settlement of the herdsmen and grazing their cattle.” With a view to protecting lives and properties within their jurisdiction, several Nigerian States such as Ekiti and Benue, spearheaded the promulgation of laws prohibiting open grazing of livestock. In Benue State the Open Grazing Prohibition and Establishment of Ranches Law, which was passed on 22 May 2017, came into force on 1 November 2017, to mixed support. Whereas its supporters saw the legislation as a preemptive tool to further conflict, pastoralists and their supporters considered it discriminatory and an impediment to herders’ source of livelihood. ​Not long after, the Federal Government mooted an alternative policy of creating ‘cattle colonies’. It is evident now that not much consultation went into the conceptualization of this latter policy. Moreover, when considered against the backdrop of political agitations for the restructuring of the federation, and in some instances, for the sovereignty of some components parts of Nigeria, the proposal to establish ‘cattle colonies’ across the nation regardless of the best intentions, assumes a sleek, if not insidious counterbalance to demands for restructuring and indeed, the self-determination sought by the Indigenous People of Biafra (IPOB). ​ Just as all politics is said to be local; economics is also localized. Therefore, whatever threatens the economy of any community is deemed to threaten its livelihood; and that is the crux presented by the proposal of a ‘cattle colony’ economy. The two contending sides, the pastoral Fulani and farming communities across Nigeria, now feel that peaceful coexistence is near impossible, anywhere there is an attempt to co-locate grazing lands and farmlands. Observers note that the situation is fraught with vast implications; and “risks to economic, socio-cultural, identity, security and legal consideration.” Ironically, the cattle economy in Nigeria as part of the husbandry and agricultural regime is historically as old as Nigeria. Therefore, the unfolding crisis orchestrated by the rising spate of herdsmen/farmers clashes must be seen as an existential problem for both sides. Were the crisis allowed to fester, the cattle colony economy, which is underperforming would be further diminished to the nation’s detriment. Social order will also be disrupted. ​Considering that the cattle industry has been around for long, it warrants asking, why the industry has been beset suddenly with spiraling violence. Why are herders moving southwards in droves, and essentially shifting the demographic base of the nation’s cattle population and the cattle economy to southern parts of Nigeria, a move which ordinarily, should be good for any economy. The answer is threefold: “the combination of a growing cattle population, the effect of climate change on the availability of water and forage crops, as well as the lack of access to North Eastern foraging grounds due to the Boko Haram crisis are the proximate causes of the increasing tensions between farming communities and Fulani herdsmen.” As we are told, “climate change is not ranked among the five top causes of conflict in Nigeria, namely, tribalism, resource control, religion, land and trade. But that reality has been altered.” And here we must ask a critically pertinent question: Is the expansive move of Nigeria’s cattle economy southward inimical to national interest and the nation’s economy at large? ​​The chief proponent of the cattle colony policy, Chief Audu Ogbeh, the Minister of Agriculture offered this perspective: “The reason we are designing the colony is that we want to prepare on a large scale, on economy of scale, a place where many owners of cattle can coexist, be fed well, because we can make their feeds. They can get good water to drink. Cows drink a lot of water. We can give them green fodder.” This thinking aligns fully with those of pastoral Fulani herdsmen, who “believe that the expansion of grazing reserves will boost livestock population, will lessen the difficulty of herding, will reduce seasonal migration, and will enhance the interaction among farmers, pastoralists, and rural dwellers.” Conversely, as Prof. Ben Nwabueze noted, “from what we know, two or more herders will be needed to follow and tend 100 cows. Accordingly, 300 herders will be needed to tend 30,000 cows. A colony of 30,000 cows requires 300 herders living in the colony. We are, therefore, talking of 300 Fulani herdsmen and their families lodged in the body of a state under the scheme.” The implications of a herder’s violence multiplier effect remains salient. ​In circumstances such as these, we must place the arising situations in their proper context. As far as the permutations, one begins to have a better appreciation of the challenges, in considering the dividends as well as opaque political implications of ‘cattle colonies’, in order to strike a sensible balance. Positive and novel as the observations were their capacity to undermine whatever economic benefits arising therefrom cannot be discounted. ​Cattle colonies in Nigeria would be attractive if they would alternatively abate or solve herdsmen violence. In 2015 alone, over 2,000 people were killed in clashes between Fulani herdsmen and farmers. In Benue State which happens to be the ground-zero of the herdsmen-farmers clashes, “since the crisis started in 2011, over 2,000 people have been killed including women and children with property worth about N95 billion destroyed.” Although herdsmen claim that their cow protection vigilantism is aimed at cow rustlers, the number of casualties from herdsmen violence rose exponentially in 2016 and 2017. It is, therefore, hardly surprising that of the 36 Nigerian states, only 16 northern states accepted to create cattle colonies and provide the 10,000 hectares of land requested from each State by the Federal Government of Nigeria. Seven states rejected the proposal outright, while the remnant states remain lukewarm toward the policy. ​ That disposition alone, underlines the fact that the controversy over the policy that promotes a cattle colony economy has become so emotive that salient realities and arguments are readily brushed aside. As Nwakanma opined, “the pastoral Fulani…does have a right to his livelihood and lifestyle. But where his rights end, the rights of the other Nigerians begin. The Fulani does not have the right, even so forcefully backed by a central power and a policy of appeasement by the Nigerian Federal Government under the Buhari Presidency, to occupy land that they just feel like occupying, but which belongs to another by long tenure.” Nigeria’s 35 million pastoral Fulani are nomadic and will remain so regardless of cattle colonies. As Muhammad Hussaini, the Chairman of Miyetti Allah Cattle Breeders Association in Nasarawa State disclosed, “If you force a Fulani man not to move with his cattle, you are inviting trouble.” It bears wondering, if the push back against the policy recommendation to create cattle colonies might have been muted, had the recommendation been to create cattle ranches, or alternatively, to create non-settlement federal reserves, where cattle can be allowed to graze, perhaps for a fee. If that is the case, we might be reacting to semantics and entrenched ethnocentric fears rather than concrete challenges. Seeking a better understanding compels one to delve into global situations that may be comparative to Nigeria. ​The present herdsmen/farmers crisis represents a policy, governance and indeed moral dilemma for Nigerian policymakers and leaders. Animal husbandry and cattle rearing as an industry has historical validity in Nigeria. So the notion of a colony is not exactly new to Nigeria, even as it remains anathema in our present circumstances. However, the salutary value of the ‘cattle colony’ economy is at risk of being totally obliterated by the ongoing crisis. ​Globally, the value chain of the cattle economy or industry is enormous. Contextually, the potentials of the cattle industry in Nigeria though huge, is still hardly being tapped. These include beef and sausage production, hide and skin, fresh milk, cheese, butter, ice cream, yogurt, infant formula, bone china, livestock feed, manure, mechanized abattoirs and indeed, job opportunities created by ranching, refrigeration and livestock transportation. Ironically Nigeria’s cattle industry as presently situated is dominated by beef supply. This is an anomaly. I say so because perceptibly, it is assumed that the cattle industry and indeed ranching, if well-articulated and domiciled will be the exclusive preserve of pastoral Fulani herdsmen. This is hardly so. Lest we forget, the famous Obudu Ranch in south-south Nigeria at the outset of its establishment had a cattle ranching component, complete with fresh milk and butter production. ​The hard reality is that Nigeria has 180 million people and a cattle population estimated in 2005 at 13.9 million, and “19.5 million cows as of 2011”, which by 2016, had grown to “22 million cows that consume about 1 billion gallons of water and 500 million kilograms of grass and forage crops” daily. What this translates into, as per capita ratio, is 1 cow to 8 persons. It is thus ironical in every context that cattle which is still in the minority, is deemed to be deserving of prime space than human beings. The cattle-human paradox confronting Nigeria does not end there. What is even more ironical is that nations that have more cattle than people don’t face the problems confronting Nigeria. Indeed, “Five countries – Uruguay, New Zealand, Argentina, Australia and Brazil – now have more cattle than people.” But there are immense benefits from Nigeria’s cattle economy that are not being tapped or even discussed. ​Recent studies are indicative of the vast value of the Nigerian cattle industry, which remains undervalued due to the informal nature of pastoral herdsmen commerce. Reforming the cattle industry will confer economic advantages and dispense with cattle grazing, which is antiquated. Naturally, the subsisting challenge throws up a heady question: What is the sustainable roadmap for optimizing the multi-billion cattle industry? To arrive at an answer, there has to be a firm grasp of the prevailing realities. ​Resort to globally accepted ranching methods as opposed to colonies will offer added value and greater dividend. “Up to 250,000 direct jobs can be created across ranch sites,” and “direct annual revenues of about $3 billion dollars are estimated from across the ranches, comprising of incomes from beef, organic fertilizer and about 200 megawatts net power exports.” The value chain from ranching is fairly broad, just as it guarantees higher yield in fresh milk, migrating cattle yield minimal milk. Statistics indicate that migrating Nigerian cattle yield ”only one litre of milk per day” compared to “10 litres per day in the Philippines, 40 litres per day for Israel’s “super cows” where technology application has made the Middle Eastern country the global leader in dairy production.” In India, the Holstein Friesian cow specie produces as much as 45 liters of milk per day. ​As important as agriculture is in Nigeria, in 2016 the sector represented only 28% of Nigeria’s GDP. It is helpful to understand how the cattle economy in Nigeria is presently exploring only four of the fifteen possible value chains, namely beef, leather, milk, and bone-china. The other sectoral value chains have remained largely unexplored, and certainly not to their optimal. Singularly or collectively, these value chains have the capacity to generate huge employment of skilled and unskilled labour valued in billions of Naira. Presently, there is a “supply gap of 600,000 metric tonnes” in our national dairy output and demand. To fill this gap, Nigeria spends more than $200 million on milk import every year and cumulatively, about $1.3 billion annually importing dairy products. Ironically, the dairy industry valued at N345 billion, represents the second largest segment of the food and beverages industry in Nigeria, even as 95% of the dairy producing herds belong to pastoralists. ​Reforming Nigeria’s cattle rearing and trade methods will boost the nation’s earnings, not just from beef, milk, butter and cheese, but from export of hides and skins. Presently, because Nigerians consume cow hide known locally as Ponmo, the nation is losing out on the global leather market that is valued at $75 billion annually, from its non-export of cow hides. It is instructive that Brazil, which initiated cattle industry reforms with expansive ranching, has assumed the status of “the world’s largest exporter of cattle meat with 213 million cattle, generating $1.2 billion in 2012 and providing 360,000 direct jobs.” In Nigeria, of the 7.5 million cattle slaughtered annually for beef, which represent N25 million turn over, 85% of the beef is sold in the open markets; 5% to fast food chains; 3% in retail stores; 3% to institutions; 3% to restaurants, and 1% to supermarkets. ​Policymakers readily admit that decision making is easier, when there is clarity between right and wrong. Where there are perceived wrongs by two sides requiring correction, decision making becomes complicated. Contextually, herdsmen migration southwards draws its impetus from prevailing climatic upheavals, even as “climate is not ranked among the top five causes of conflict in Nigeria.” Yet, we know that rather than address such vagaries of climate and related challenges confronting cattle producing states of the North, migration to the greener South is considered by herders and some policymakers as a cheaper economic alternative. This thinking discounts the non-economic but far more higher cost in lives and social disorder. This may explain also why “northern elite unwisely press for grazing routes and reserves in the South instead of afforestation, irrigation, ranching and mechanized technology.” On the flip side, those opposed to cattle colonies vehemently insist that cattle ranching is essentially private business; while discounting or glossing over that cattle business represents a huge source of employment and livelihood for pastoral herdsmen as well as others engaged in it. ​In concluding, I will like to dwell briefly on the value, imperatives and benefits of cattle colonies, or lack thereof. The crisis in Nigeria’s agricultural sector is traceable to our long fixation on oil as the main foreign revenue earner. The cattle industry and economy suffered decline and neglect as much as the groundnut, rubber, cocoa, palm produce, tin ore and coal industries, which also all lost value as foreign revenue earners. Yet, the scope and capacity of the cattle industry to generate wealth and employment, remains huge. Regrettably, we have through public policy failure and myopic considerations, unwittingly approached cattle rearing and ranching as the exclusive preserve of the pastoral Fulani. That could hardly be so. We need to start looking at how the nation as a whole can embrace and benefit from the cattle economy. Not doing so will mean sections of the country being averse and hostile toward those who legitimately engage in the business as well as those in the violent fringe that engage in killings in order to provide food for their herd and protect their livelihood. ​The subsisting challenge is whether as a policy, the introduction of cattle colonies is perceived as serving public interest and common cause. Given the prevailing dichotomy towards the cattle colony policy, the answer while still debatable, may seem obvious. In truth it is not. Whereas there is a clear divide, over the policy due to rights to livelihood and security concerns, such concerns do not outweigh the economic dividends of a cattle colony economy or for that matter, whether the industry can become economically viable as it is in other nations. This conclusion is by no means suggestive of an implicit or explicit endorsement of cattle colonies in communities or states that have rejected them. ​Nevertheless, the present circumstances complete with its challenges and fault lines, offer Nigerian leaders a vast problem-solving window to seek creative solutions, while turning potential problems into opportunities. On establishing of cow colonies, it is evident that two sets of groupthink have emerged; those opposed to cattle colonies or any formalized land-for-cattle arrangement and those in favour. Whatever is the case, it is self-evident that the challenges confronting the age-long cattle industry, has like everything else in Nigeria become highly politicized. While we cannot ignore the attendant “visceral violence and bloodletting,” now associated with the cattle industry, we have a collective responsibility to act. We must stand firm in these challenging times. That is a clarion call. ​Going forward, policymakers and the political leadership in Nigeria need to change the policy narrative pertinent to the cattle economy, taking into account missed opportunities and lessons learned. For their part, “states considering legislation on farmer-herder relations should do so with caution and with ample time for consultations and development of support mechanisms for affected parties.” If there is policy clarity and ironclad guarantees etched in legislation that ranches across the width and breadth of Nigeria will be domiciled in States where the ranchers must be predominantly indigenes of that State, then perhaps, the subsisting concerns over ‘Trojan horse’ type immersion of hostile and potentially violent herdsmen will abate. If that can be accomplished, Nigerians can begin to enjoy the full impact of the cattle economy that is globally vibrant, expansive and recognized as an industry that returns good dividends on investments via its various value chains. 7 Fr. Pat Amobi Chukwuma, “Cattle Colony and Colonization,” Fides, Jan.28-Feb.3, 2018 Edition, p. 10. 8 Chris M.A. Kwaa and Bukola I Ademola-Adelehin, “ The Implications of the Open Grazing Prohibition & Ranches Establishment Law on Farmer-Herder Relations in the Middle Belt of Nigeria, Search For Common Ground Publication, December, 2017. 14 Oseloka H. Obaze, , Prime Witness, Change and Policy Challenges in Buhari’s Nigeria; Ibadan, Safari Books, 2017. 23 Rose Eembi and Gyang Bere, “Herdsmen Overrun Plateau University,” Dailysun Tuesday, February 13, 2018, p.8 24 This would translate to 370,000 hectares of land allotted to those in private cattle business. 26 Chris M.A. Kwaa and Bukola I. Ademola-Adelehin, “ The Implications of the Open Grazing Prohibition & Ranches Establishment Law on Farmer-Herder Relations in the Middle Belt of Nigeria, Search For Common Ground Publication, December, 2017. 27 In the U.S. there are federal reserves, where wild horses and other protected species roam free. 28 “Agriculture and Economic Diversification in 2018,” Editorial, Sunday Sun, January 20, 2018. 29 “Nigeria has population of 34.5million goats, 22.1million sheep and 13.9million cattle.” See O. A. Lawal- Adebowale, “Dynamics of Ruminant Livestock, Management in the Context of the Nigerian Agricultural System.” https://www.intechopen.com/books/livestock-production/dynamics-of-ruminant-livestock-management- in-the-context-of-the-nigerian-agricultural-system. 34 The cattle industry core value chains include beef and sausage production, hide and skin, fresh milk, cheese, butter, ice cream, yogurt, infant formula, bone china, livestock feed, manure, mechanized abattoirs, refrigeration and livestock transportation, ranching and ancillary job opportunities. 45 Oseloka H. Obaze, Prime Witness, Change and Policy Challenges in Buhari’s Nigeria; Ibadan, Safari Books, 2017. 46 Chris M.A. Kwaa and Bukola I. Ademola-Adelehin, “ The Implications of the Open Grazing Prohibition & Ranches Establishment Law on Farmer-Herder Relations in the Middle Belt of Nigeria, Search For Common Ground Publication, December, 2017. (C) Oseloka H. Obaze, A Selonnes Consult Ltd. Publication.